If nothing else has convinced Metro arts viewers of Gallery 1516’s commitment to Nebraska artists since its opening in 2015, the current venture of gallery founder Patrick Drickey should do the trick. The Midwest Biennial, not seen since its demise in 1988 at the Joslyn Art Museum after its popular but controversial run beginning in 1950, has been resurrected under new management at Gallery 1516 and given a new name, the Nebraska Artist Biennial. The new juried Biennial (NAB), which continues through Dec. 30, opened to largely favorable reviews by both patrons and artists and enjoys a steady stream of each during gallery hours on the weekends eager to see the showcase alive and well once again. “With 67 artists in the show, we anticipated a big crowd, but we were pleasantly surprised and overwhelmed at the turnout,” Drickey said. What is “ground breaking” of course is the rebirth of the Biennial itself and all the preparation and production that went into it. Drickey and those who consulted with him relied upon three qualified jurors: Anne Pagel, curator for Lincoln art collectors Karen and Robert Duncan, Linda Rajcevich, former Deputy Directory of Joslyn Art Museum and Russ Erpelding, ARTreach Curator for the Museum of Nebraska Art. The three jurors chose well from the nearly 500 pieces submitted in four categories and put on display many of Nebraska’s most representative artists while awarding five of them for “their original, exceptional, and compelling work” with cash prizes totaling $10,000. The winners of the 2017 NAB included: Ardith Starostka of Columbus, NE, the Richard D. Holland Best of Show Award of $5,000; Milt Heinrich PhD of Blair, NE, the Milton Wolsky Award for Painting – $1,000; David McLeod of Omaha, NE, the Kent Bellows Award for Drawing – $1,000; Monte Lee Kruse of Omaha, NE, the William Henry Jackson Award for Photography – $1,000; and Nicholas Clark, the J. Laurie Wallace Award for Student/Emerging Artist – $1,000. In addition, Gallery 1516 will take ballots for a People’s Choice and Artist Choice awards of $500 each until Dec 27 and winners will be announced Friday, Dec. 29 at a closing event, 7:30-9:30 p.m. Artists can also benefit from sales, 14 so far and more pending Drickey said, and all proceeds going to the artists. The Biennial also benefits from its museum-quality setting at G1516, arguably the most impressive new gallery space in the region with its combination of urban industrial design, excellent sightlines and dramatic lighting that gives each artwork its space and distinction. The gallery has elevated every exhibition it has showcased since its inception. The 2017 NAB is no exception. Not since two excellent exhibitions, Bemis Center for Contemporary Arts’ juried Nebraska Rising (2016) and Joslyn’s Art Seen: A Juried Exhibition of Artists from Omaha to Lincoln (2015), have viewers seen a better, more representative group display of Nebraskan artists. Yet, both Nebraska Rising and Art Seen had a smaller geographic scope and benefitted by being a juried invitational, thus virtually guaranteeing that many of Nebraska’s finest would be showcasing their most au courant work. They were memorable exhibits, reminiscent of earlier Joslyn invitationals and Bemis’ collaborations with the Nebraska Arts Council, each well worth repeating in the near future. The Biennial takes a different tack, casting a wider net by definition and not requiring current work, which explains how and why the exhibition may look more traditional by comparison. This is understandable given NAB’s above mission and intent to begin anew on solid ground. And the artists who submitted responded in-kind with mostly polished, established work within their comfort zone, even the student/emerging artists who were accepted. 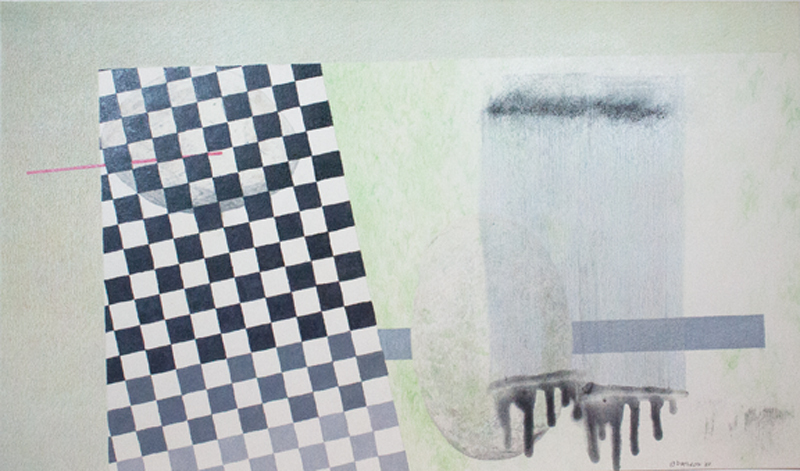 One may disagree with the judges’ awards—they were careful to include finalists in each category, which are marked in the exhibit and included in the small catalogue—and the artist, and people’s choices may indeed reflect this when announced… Yet, as described below, the winning work earned its honor. Starostka’s ultra-realistic painting “Wallflower” dominates one’s view deservedly so from afar and up close which isn’t always true in this space. This is no ordinary female figure portrait in the classical style. 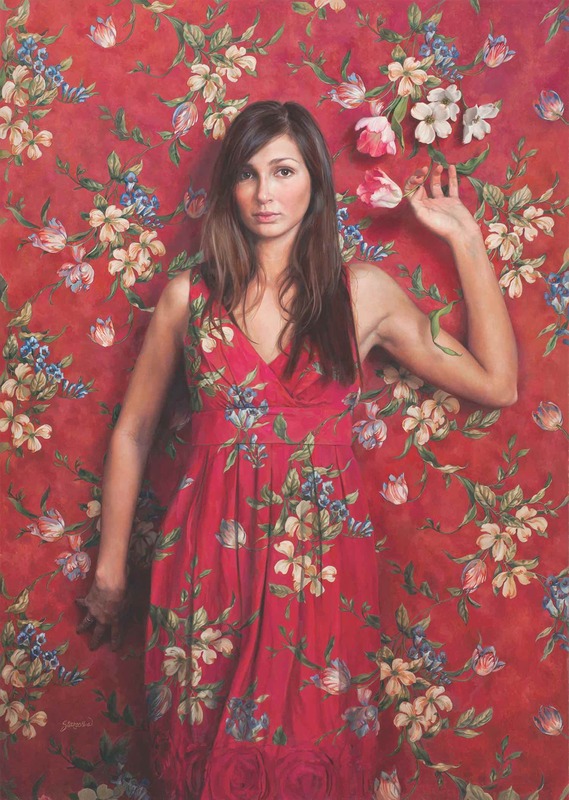 Exquisitely detailed and composed in crimson, “she” is attired in same flowered material as her background complete with visual tropes or tricks such as being draped by “real” foliage or hand-holding a petal. It appears that this wallflower has blossomed, ready for her close-up. 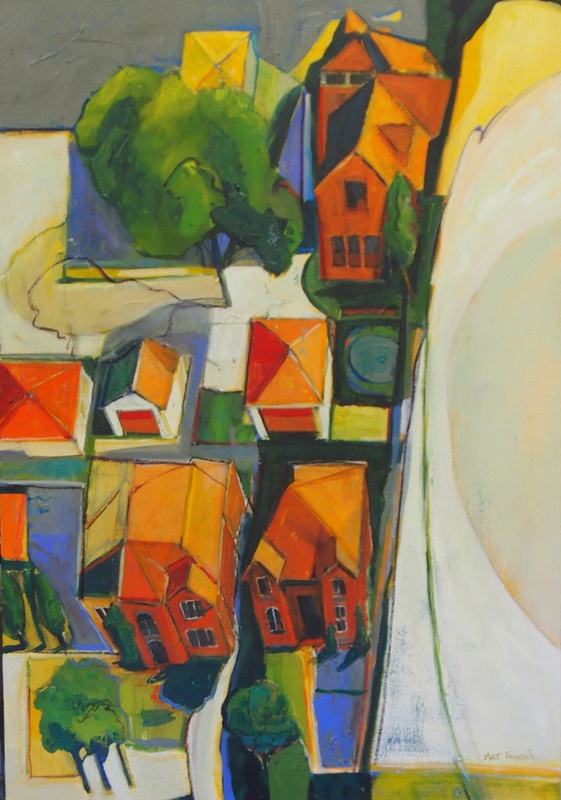 Another variation of a familiar genre is Heinrich’s landscape acrylic painting, “Neighborhood No. 1,” a birds-eye or drone’s-eye view of otherwise familiar ground. But, seen from above, the artist is able to transform an ordinary setting into a pleasing composition of color, geometric shapes, volume and motion. Even less familiar and more disorienting is Kruse’s photographic “Election Time” from his “Hummel Park” series. 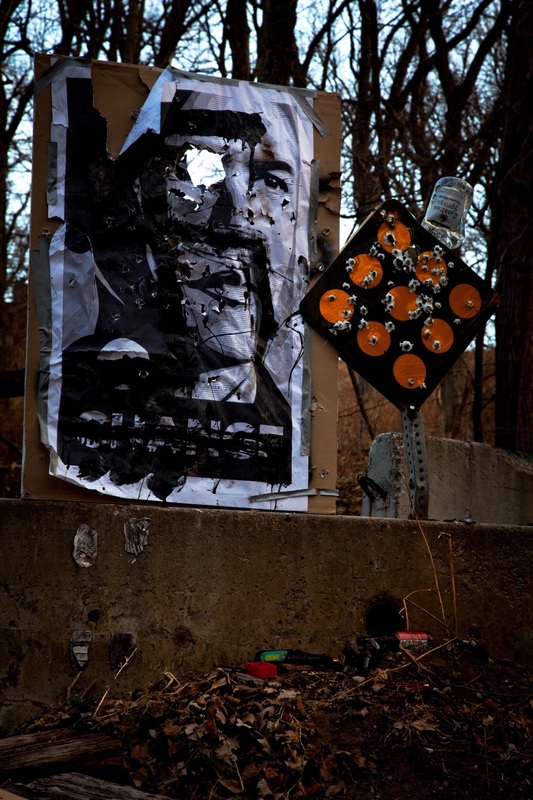 Riffing on the legend and rumors surrounding this storied Omaha park in its northern hills, the artist departs from his signature expressionistic figurative work and has manipulated a found landscape of some forbidding filled with a one-eyed Obama election poster forecasting change and orange caution signs for all who enter and engage. His clash of nature and civilization is as beautifully bleak and symbolic as a Cormac McCarthy scenario. Another fitting but more subtle contrast in this exhibition is McLeod’s mixed media drawing “Cather Abstraction,” an asymmetrical balance of a fixed geometric pattern and fluid and runny mark-making, layering and even stamping in a nicely muted palette of gray-green and black and white. His abstract works are basically conceptual arrangements often based upon ideas experimented with as far back as graduate school. 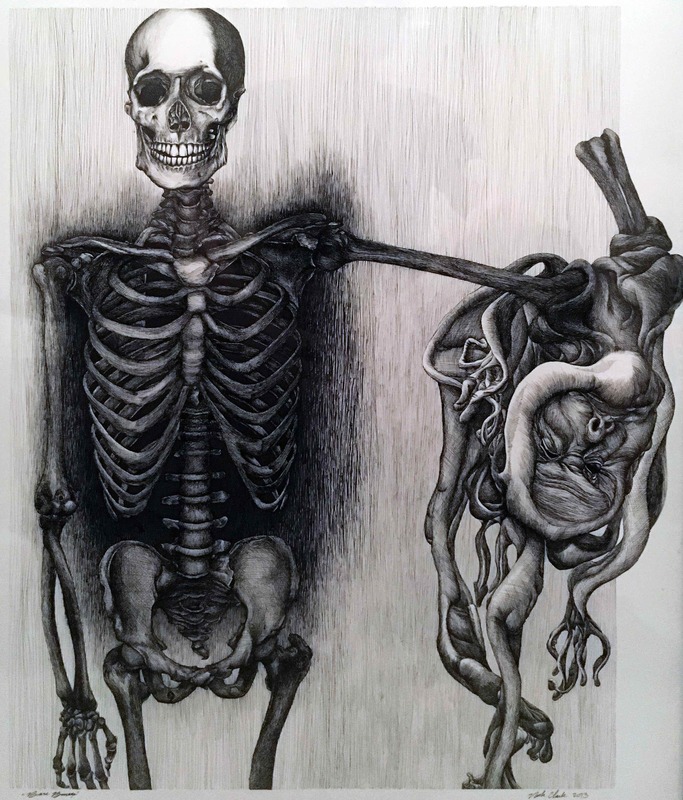 A muralist by reputation in Omaha, student artist Clark brings his pop sensibility to play in “Bare Bones,” microntec pen on Bristol paper. This rather grotesque exercise in the Gothic aesthetic indicates three things: one, he knows his audience; two, he demonstrates a masterly technique with his medium; and three, it’s time maybe to create contemporary 2D art with that same street vision and pop sensibility we see in his mural collaborations. There is also impressive work from a mix of established and emerging artists who on a different day might have been similarly rewarded. They include finalists in their category Mads Anderson, Peter Wakely, Brian Wetjen, Diane Lounsberry-Williams, Joe Broghammer, Watie White, Marlene Mueller, Tim Guthrie, Larry Covalciuc, Jim Scholz, Katie Samson, Mark Sabaliauskas II and Casey Calllahan. All of whom who have brought something to Nebraska’s canvas of significant art in this exhibit. Several additional pieces from Susan Knight, Larry Roots, Brian Gennardo, Dan Crane, Christina Narwicz, Larry Ferguson, and Jeremy Caniglia are further proof of Nebraska’s diversity of medium and style and deserve a second look before the exhibit closes Dec. 30. Personal favorites below may include some surprises. There is no finer work of contemporary art in the NAB than Walkley’s stunning “Restless Cloudy Night,” an acrylic on board that made the finals for Best of Show. The very antithesis of the winning “Wallflower” in style, mood, color and attitude, Walkley’s edgy, expressionistic nightscape with its minimalist composition, low angle and detached point of view, leave this neighborhood narrative at the top of the hill to one’s imagination. Factor in a background of blue and gray billowing clouds and the artist has found intrigue in an otherwise ordinary setting. 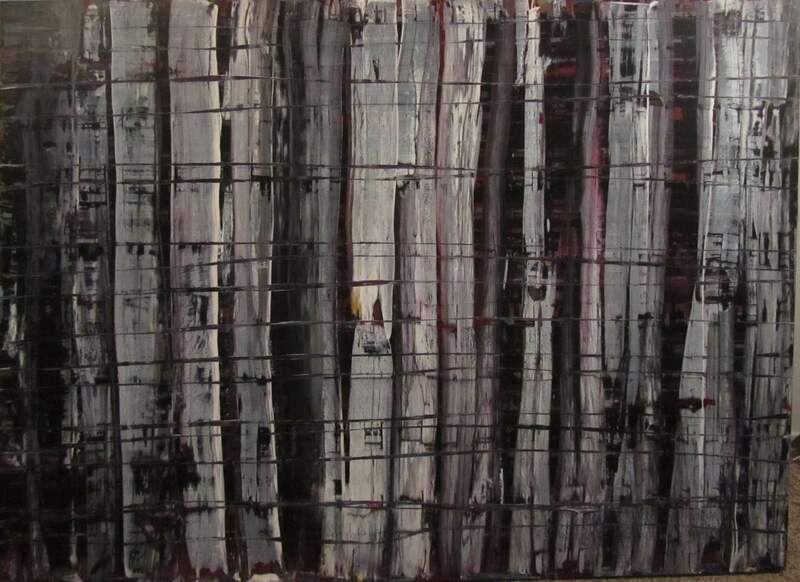 Nearly as beguiling but for a different reason is Omahan Michael Giron’s acrylic on board “Red Forest.” A departure from Giron’s past dense and expressionistic imagery, his more current abstract, environmental paintings can play tricks with perception depending from where it’s viewed. Though the work is interesting up close, we are encouraged to see it from a distance allowing us to “see the forest for the trees,” perhaps acknowledging how all environmental issues as well should be viewed and understood. This is encouraging work from an artist who has also made a difference as educator and muralist in the community. Also a bit of a departure is the pleasing work from realist landscape artist Kim David Cooper from Ashland and Omaha sculptor Sora Kimberlain. You may be more familiar with the former’s Impressionistic, pastoral pieces, particularly his plein air paintings, but Cooper’s aptly titled “Colonnade” of tall trees lining a country lane shifts to a more Post-Impressionistic style with its more distinctive brushstrokes, thicker use of paint, and vivid color and contrast of dark and light. Conversely, Kimberlain’s expressionistic oil on paper, “Changing Places,” is even more textured, passionate and gestural. Two figures dance, embrace in wild abandon and appear to change more than places. Best known for her more disciplined and elegant sculpture, nonetheless, the artist continues to explore gender issues and identity in 2D. Lastly, Drickey promises that G1516 will be able to include a 3D category in the next NAB, May of 2019, but Camille Hawbaker’s wall hanging comes close as she brings the “Love” in that direction. The post-emerging Hawbaker has proven herself of late to be one of the region’s original artists. “Love,” a silky mix of thread, text and paper, is further proof of her talent. Technically not a 3D work, its experiment in fiber art and print deserves to be a finalist in the Painting/Mixed Media Category.